2019 Western Apicultural Society Conference Comes to Ashland, Oregon Could Wildfires Benefit Bees? The “Community Waggle Dance Tabletop Show,” where attendees can apply to show off a hive design, their research, a tech innovation, etc. A “Roundtable Speed Swarm” event where guests will rotate (in groups) to speaker-hosted tables to spend some time in dialogue with a leader they have been admiring from afar. 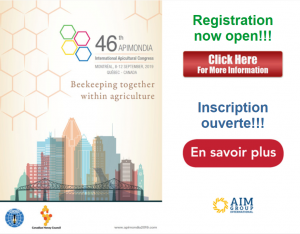 Throughout the conference they will provide multiple breaks and a happ-bee hour each evening to encourage beekeepers to meet up and waggle dance with someone who’s also into beginning beekeeping, honey production, co-ops and supply chain management, bee habitat, native bees, or bee-themed travel and service opportunities, etc. The cutoff for reserving rooms with a reduced rate at Ashland Hills Hotel & Suites, the conference venue, is April 8, 2019. A later date was provided in the February 2019 issue of the WAS Journal. We regret the error. *The deadline for submitting applications for the Community Waggle Dance Tabletop Show is March 31, 2019. *Early-Bird Registration ends June 11, 2019. Jim Rivers went into the burned forest looking for bees. As an assistant professor at Oregon State University, specializing in forest ecology, Rivers knew that forests regenerating after a disturbance like a fire, windstorm, or logging often saw a rise in pollinators like bees. But he also knew that bees were in trouble. More than half of native bee species in the US had declined severely in number since 2005. . . . In a paper appearing in April’s issue of Animal Behaviour, the researchers present . . .
We need to recover and apply the strategies of various local communities and indigenous peoples around the world to conserve and protect pollinators, such as bees, butterflies, moths, some bird species, and bats. That is the warning given by the study “Biocultural approaches to pollinator conservation“, which has just been published in the journal Nature Sustainability, and is co-authored by Elisa Oteros-Rozas, a Juan de la Cierva researcher in the Chair in Agroecology and Food Systems at the UVic-UCC. The study was co-authored with an extensive group of university researchers from . . . The research, published in the journal Nature Communications, also showed that . . .
WEST LINN, Ore. (KOIN) — Bees have new friends in West Linn. West Linn is now a Bee City USA, one of 80 cities nationwide that worked to improve their landscape for pollinators. The unanimous vote by the West Linn City Council was the result of months of work between the West Linn Parks and Recreation Department and the Xerces Society. . . . The National Pollinator Garden Network (NPGN) was originally founded by nine organizations including the American Seed Trade Association (ASTA). In June 2015 the NPGN launched the Million Pollinator Garden Challenge (MPGC) and just recently surpassed its original goal. “We wanted to get a million gardens planted with pollinator-friendly flowers and . . .
For the past few decades, members of the Association of Zoos and Aquariums throughout the United States have been partnering up with private organizations and local, state, and federal agencies to restore and reintroduce species into their natural habitats. They’ve also been stepping in to preserve land in their own backyards (as well as further afield)—to give mammals, reptiles, insects, and fish a leg up as climate change, development, pollution, and other threats continue to challenge their survival. Below are a few highlights . . .
New Pollinator Poster Available for Pre-Order The 2019 poster, Endangered Pollinators and their Habitats, features beautiful artwork by Carol Schwartz. This poster displays numerous North American pollinator species that are at risk and listed as federally endangered or threatened in the United States, Canada, and Mexico. Learn more about the species, artist, and poster at https://pollinator.org/shop/posters! “What we found is that the best way to protect pollinators is to support . . .
“It’s the first time that people are using this kind of technology to have two different species communicate with each other,” says Simon Garnier, a complex systems biologist at . . .
“The good news is that the chemical composition of honey in Vancouver reflects its environment . . .
UNIVERSITY PARK, Pa. — Pests and diseases are taking a substantial bite out of the world’s five major food crops — in some cases, up to 40 percent. Scientists at Penn State, Cornell and four other universities worldwide recently teamed to study and inventory the impact of plant diseases and insects on a global scale. “Declining crop health affects everyone . . .
PHOENIX, Ariz. (March 19, 2019) – An independent test of top selling honey products sold in U.S. grocery stores found zero instances of adulteration. In all, the 30 top selling products were tested, all of which represented the top items in the honey category as determined by Nielsen’s recent 2018 honey category research. These brands account for approximately 40 percent . . .